According to BBC News, "Bohemian Rhapsody" has been released in China without any scenes of a homosexual nature. The QUEEN biopic tells the story of the legendary British rock band and its frontman Freddie Mercury, who was a gay man. 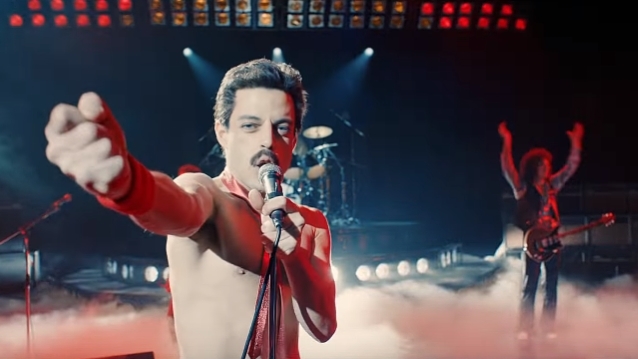 "Bohemian Rhapsody" was released in China on Friday, but references to the singer's sexuality and AIDS diagnosis were censored. Given China's strict policy on LGBTQ representation in entertainment, around four minutes' worth of footage was cut out of the film, including scenes of two men kissing and the word "gay". Also missing is including the scene in which Mercury comes out to his then-girlfriend. Feili Xie, a 28-year-old gay man from Beijing, told the ABC that while he was in favor of "Bohemian Rhapsody" being screened in China, he was disappointed about the "devious treatment" censors gave the film. Last month, China censored Rami Malek's Academy Awards speech. The actor, who won an Oscar for his portrayal of the late singer in the film, had a LGBT reference censored by Mango TV, one of China's most popular channels and one of only two networks that live-streamed the Academy Awards telecast in China. While accepting the prize, Malek said: "Listen, we made a film about a gay man, an immigrant, who lived his life unapologetically himself, and the fact that I'm celebrating him and his story here tonight is proof that we're longing for stories like this." Mango TV's subtitles removed "gay man" and replaced it with "special group." "Bohemian Rhapsody" received a limited released in China by the National Alliance of Arthouse Cinemas (NAAC), a public-private initiative run by the state-supported China Film Archive and a consortium of commercial theater chains.